This German European Policy Series by Ulrich Krotz, European University Institute, and Joachim Schild, University of Trier, examines the importance of France and Franco-German bilateralism for Germany’s power and influence (Gestaltungsmacht) in Europe, as well as for its ability to safeguard German interests in the context of European integration and EU affairs. 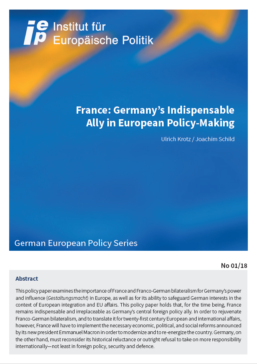 This policy paper holds that, for the time being, France remains indispensable and irreplaceable as Germany’s central foreign policy ally. In order to rejuvenate Franco-German bilateralism, and to translate it for twenty-first century European and international affairs, however, France will have to implement the necessary economic, political, and social reforms announced by its new president Emmanuel Macron in order to modernize and to re-energize the country. Germany, on the other hand, must reconsider its historical reluctance or outright refusal to take on more responsibility internationally—not least in foreign policy, security and defence.